All user defined fields are available to be added to the list views. By default they are left unchecked. To add a UDF to the list view, right click on one of the list headers and select each of the UDF fields you want added to the list. 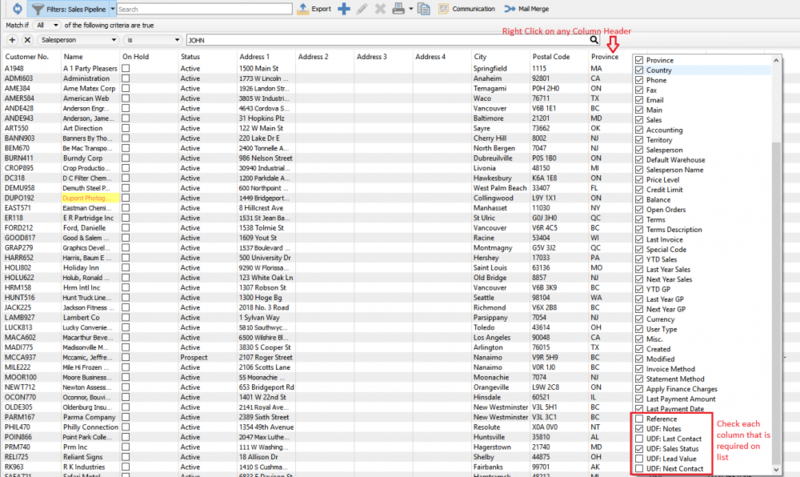 *NOTE: With the addition of UDF’s to the list view, if there is data that you want to track and Spire does not have a field for it, simply add what is required and this data is presented in an easy to see format. *NOTE: In the below example you can see that the sales pipeline data added to the customer lists are even available to be used in filters, and therefore exports as well.